For Executive Coaches, Life Coaches and Coaches in the Workplace…..
Back in 2002, I was one of the original developers of a coaching model that helps individuals get the best from everyday life. Cognitive Behavioural Coaching is a model that works for coaching clients in everyday situations. With its origins in psychology, Cognitive Behavioural Coaching (CBC) is a powerful coaching model that draws on evidence based psychological models. CBC aims to help clients gain a perspective about whatever is at the root of that person’s difficulty. Coach and client work together to identify what might be stopping an individual from reaching his or her full potential and what action is needed to take charge of their situation. A One-Hour Presentation with accompanying Audio file to download so you can follow along slide by slide as I take you from the origins of CBC to showing you exactly how to apply it with your clients. A Companion E-Book with a wealth of practical examples to get you started and assist the coaching process. The strategies, activities, techniques and exercises are most effective in helping individuals identify and challenge individual thoughts, feelings and behaviours that are self-defeating. Negative thinking leads to negative emotions and negative emotions lead to negative behaviours, all of which has an effect on an individual’s body. ‘An Introduction to Cognitive Behavioural Coaching’ – is presented as 2 separate PDF files (zipped together for your convenience) for the very affordable price of £24.97 + VAT. 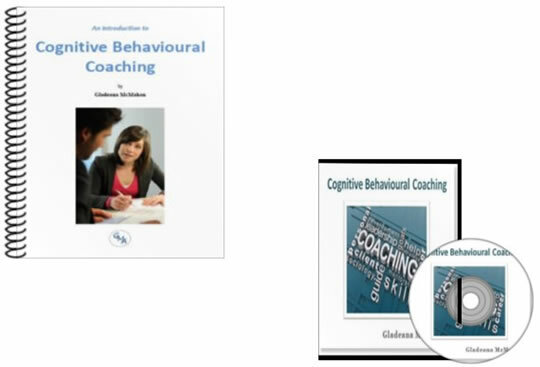 If you’re an Executive Coach, or Coach in the workplace, I hope this ‘Introduction to Cognitive Behavioural Coaching’ will become an invaluable resource and reference guide as you put the powerful process into action with your clients. Once you place your order, you’ll be directed to a confirmation page. The link to the download page will follow shortly afterward by email so you can start reading immediately (no waiting around for shipping).